Two sets of aural gold. Always a sonic koy. Ever enigmatic shoegaze superstars The Besnard Lakes continue to enthral all. The Canadian band are adored by the critics and have seen two albums nominated for the illustrious Polaris Music Prize. Their band members now include drummer Kevin Laing, guitarists Robbie MacArthur and Richard White with Sheenah Ko on keys and husband plus wife team Olga Goreas and Jace Lasek. 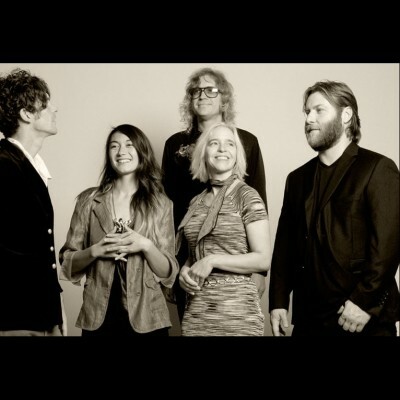 They have just announced the expected release of sixth studio album The Besnard Lakes Are The Divine Wind later in the year. They have announced exciting upcoming headline shows to promote the highly anticipated new material. See them play at Ruby Lounge in Manchester and London Oslo during May, 2017. The Besnard Lakes tickets can very soon be yours. Released at 09:00 on Friday 3rd of February, you can set a personal reminder with Gigantic right now to alert you when they become available with a text message or email. The sextet from Quebec have released five studio albums in their fourteen year career, each known for their inventive name. The first being their 2003 debut released Volume 1, followed up by second album The Besnard Lakes Are The Dark Horse, The Besnard Lakes Are The Roaring Night and Until In Excess, Imperceptible UFO. Their latest album offering was entitled A Coliseum Complex Museum which only came out last year. Given their cult band status, the demand for our limited supply of The Besnard Lakes concert tickets is massively high so you need to be fast in booking yours. With great customer service and a huge range of essential gig tickets on offer, you know it makes sense to stick with Gigantic whenever you are booking your big night out.